It's always so nice to come back to Venice after being away anywhere ... the familiar sights and sounds, the community of wonderful, generally like-minded people here in our little bubble, the possibility of absolutely anything at all happening ... I love it. And so do a lot of visitors to our little beach town, and who can blame them? But ... I was coming back from my first beach walk of the year, and I was waiting at a stoplight next to a bunch of people on a bike sightseeing tour. The tour guide had on a Madonna-like headset microphone, and was broadcasting his little tour tidbits (that anyone could read on any brochure about Venice) over a little amplifier that must have really pleased the Canal residents whose window they were right outside of. The guy was telling them how he was about to lead them to the shopping street called Abbot Kinney, named after the founder of Venice. Deep, insightful stuff. Why anyone needs a tour guide to check out a shopping street is beyond me, but there they all were, in their dorky helmets, single file riding up Venice Boulevard all nervously (I guess I should just be happy it wasn't a Segway tour. Ugh). It took everything I had to not kidnap them all and take them to some REAL Venice spots, with REAL Venice people, with actual REAL stories behind them that are actually interesting. I kept catching up to them at the next light, and each time resisted the urge to school the guy in front of his Millenial-looking charges. But I'm trying to be a good Ambassador. We parted ways as I headed off for the French Market for a coffee (where you will still see REAL Venice residents), and was immediately met by this Jules Muck art car ... dubbed "Tourist Trap". I believe I actually laughed out loud at the timing. Look, I know we're a tourist trap here in Venice, and I may have even contributed to it being so by telling all of our great stories that make people want to visit (Sorry, not sorry). It would just be cool if the people (Gentrifiers) making money off of our beloved town (and there are many) would first be cool, for sure be accurate, definitely not annoying, and absolutely give back to the community in some way. 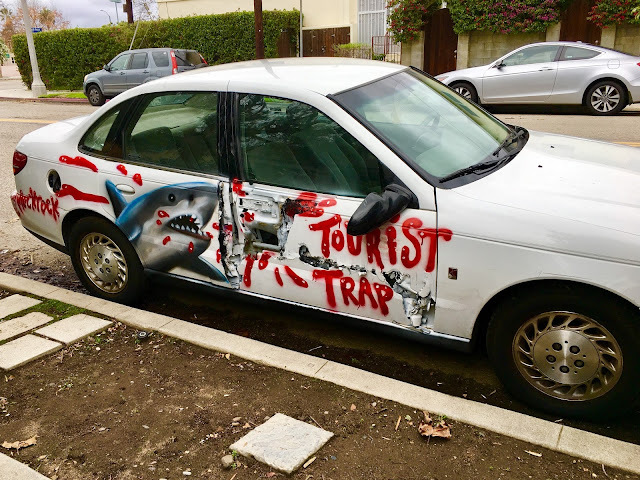 We know Venice is the second biggest tourist attraction in Southern California after Disneyland, so why does the City of Los Angeles not repay the favor with merely a FRACTION of what they make off of us, and put it back here (E.g. - Clean beach bathrooms. Paying Jesse Martinez for his daily skatepark cleaning. A ton of other things ...). I guess I'm saying if we're going to be such a tourist trap, let's be a City of our own, and rule it ourselves. And I KNOW I'm saying - and will continue to say throughout this incoming Administration - POWER TO THE PEOPLE. (Including Tourists).